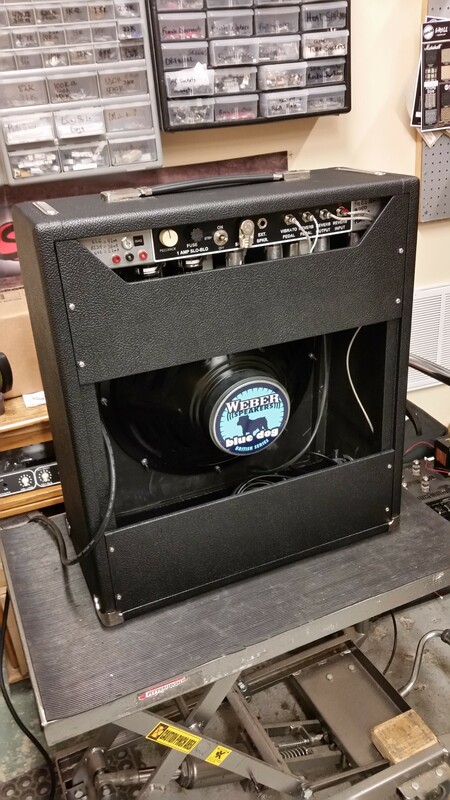 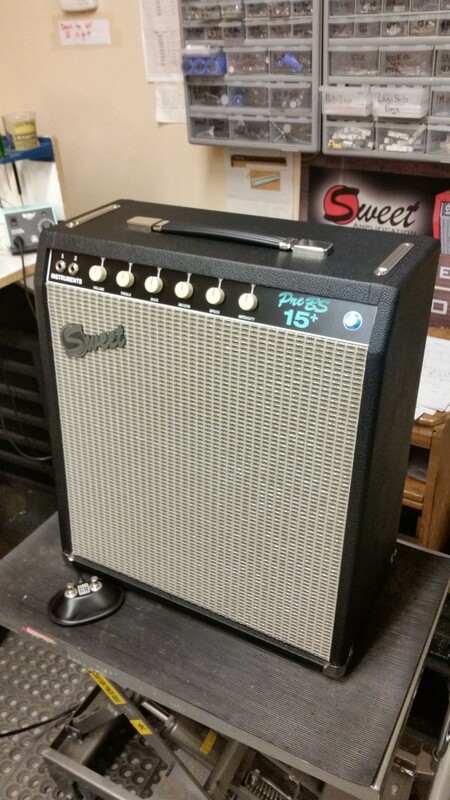 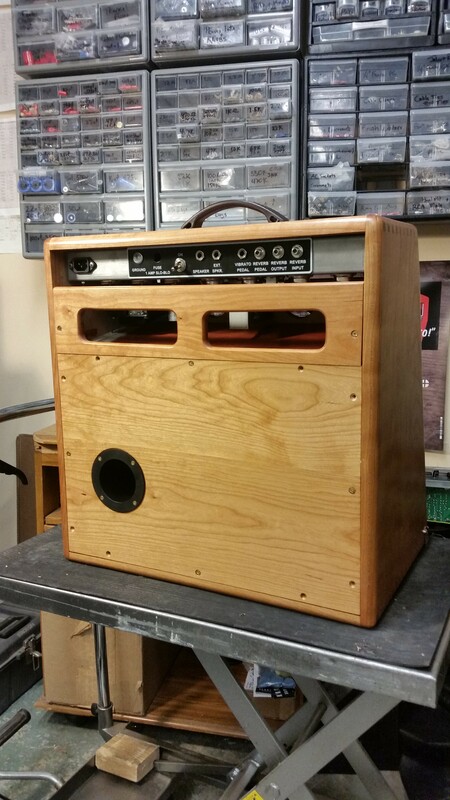 A custom cherry 1×12 speaker cabinet for a black or silverface bassman head! 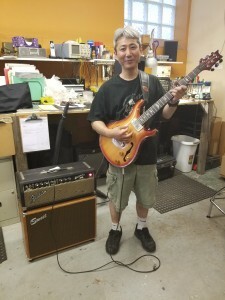 Made for a friend, Chicago Blues, Jazz, R&B guitarist Hiro Konishi. 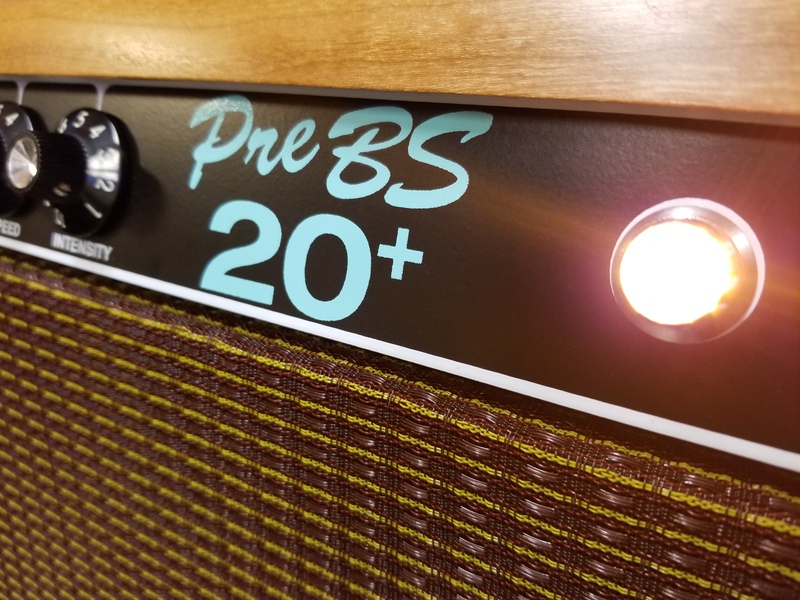 Fresh off the bench, this PreBS 20+ is extra Sweet with top of the line Mercury Magnetics trannies, solid cherry cab with dovetail joints and hand rubbed oil/urethane finish. 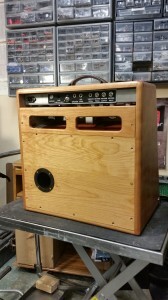 This time around I went with a traditional 1×12 baffle featuring a hemp cone Eminence Cannabis Rex. Of course it also has all the bells and whistles too like push-pull bright and mid-boost pots and negative feedback control to dial in the amount and character of headroom/breakup. 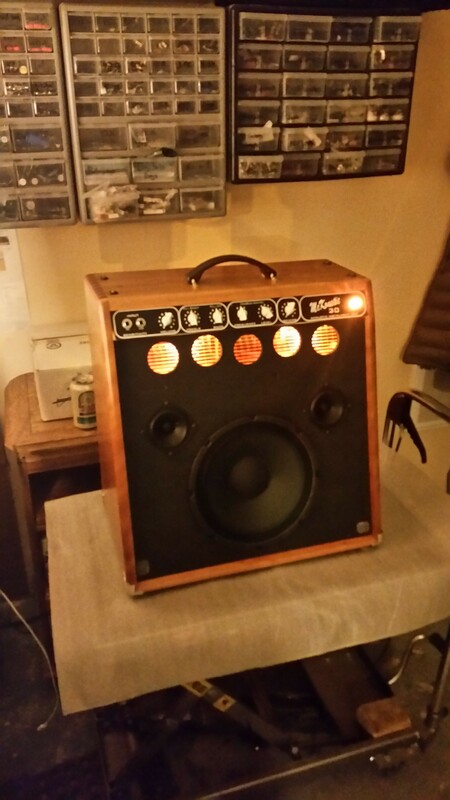 Equally at home in the studio or on stage. A Deluxe reverb style build and then some! 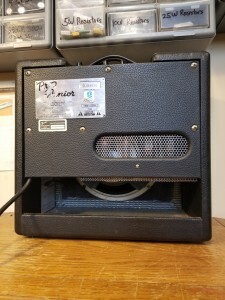 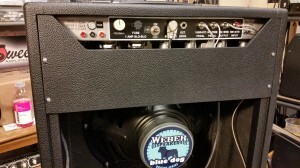 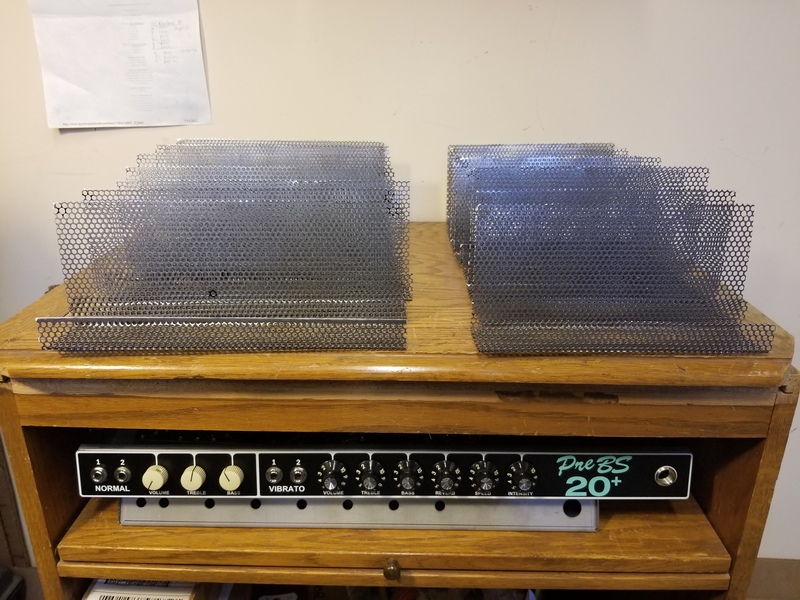 A pair of 6V6 or 6L6 power tubes put out from 20W -35W and a user adjustable bias pot on the rear panel makes tube changes simple and saves you $. The best inside and out! 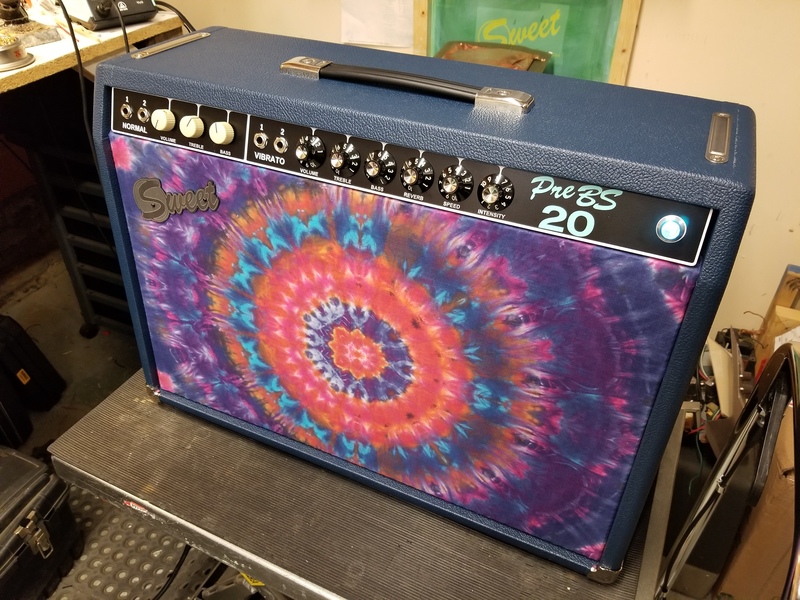 Available for demo and purchase now! Stop by Chicago Fret Works for a test drive. 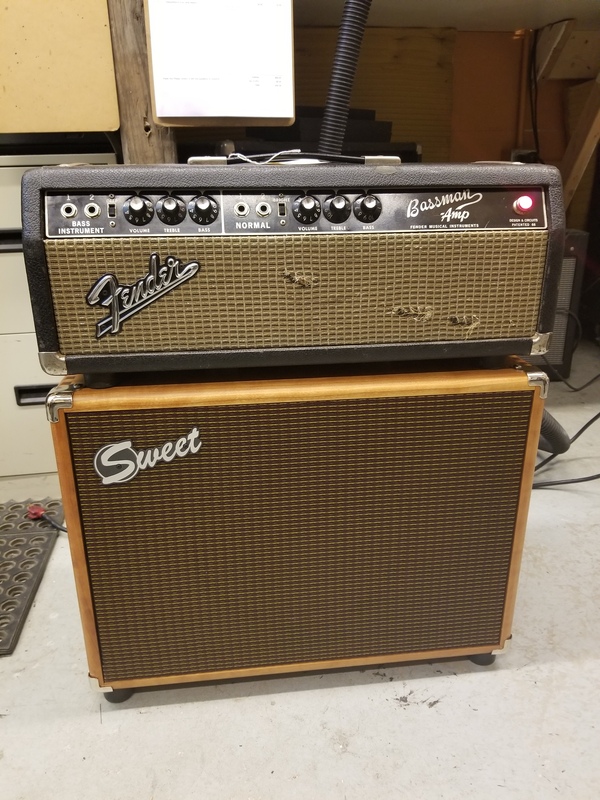 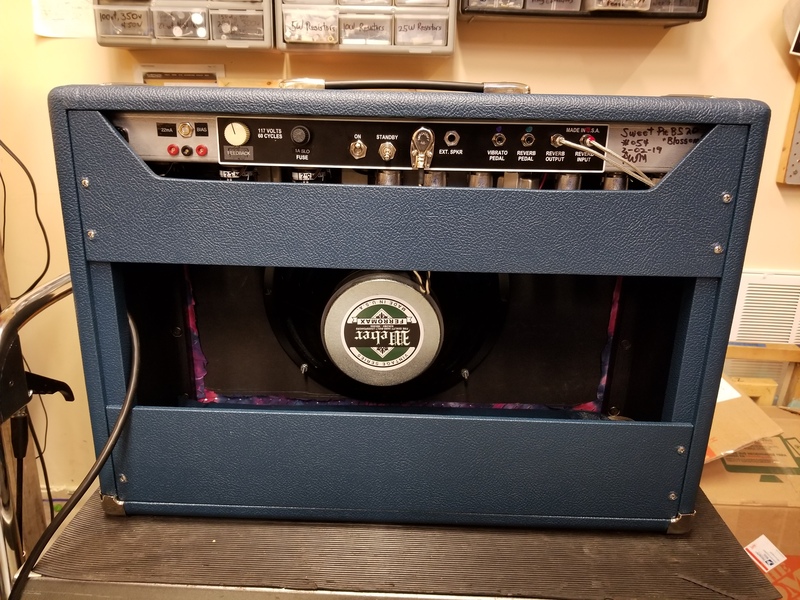 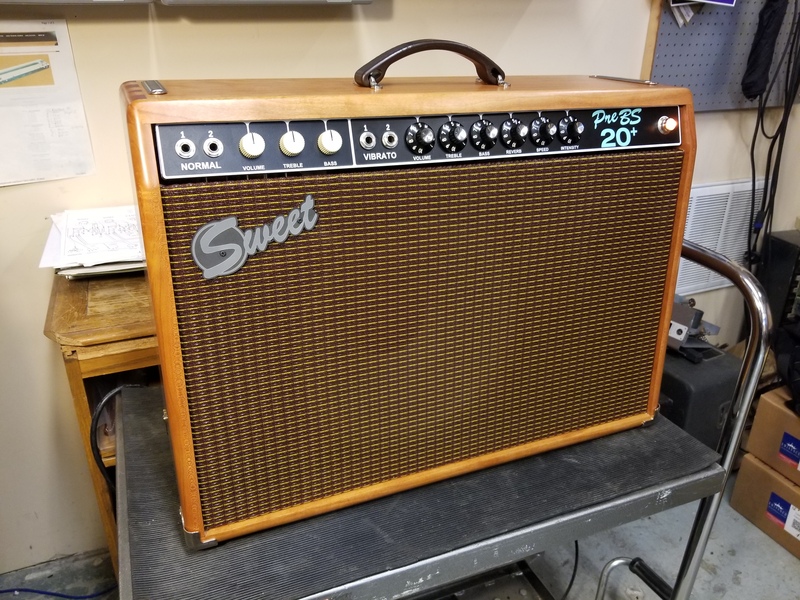 Give me a call to set up a private demo with your guitar and pedals in the amp workshop where you can crank it up, compare to other Sweet amps, or even bring your current amp! Many custom options available. 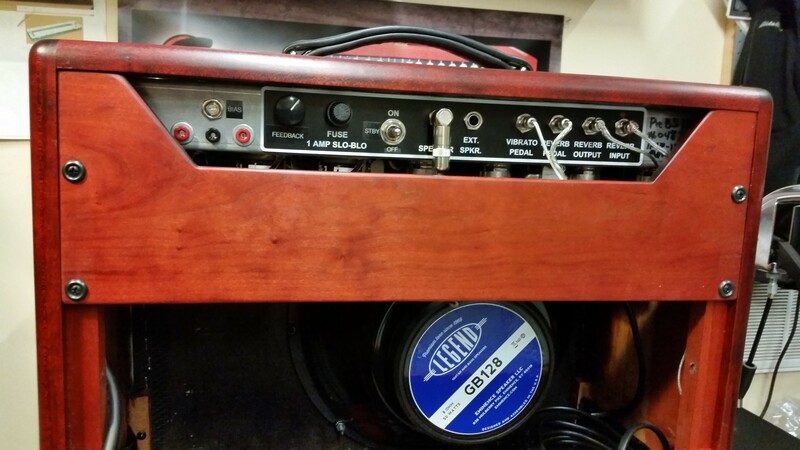 Choose your speaker, tubes, and have it dialed in for your preferences. 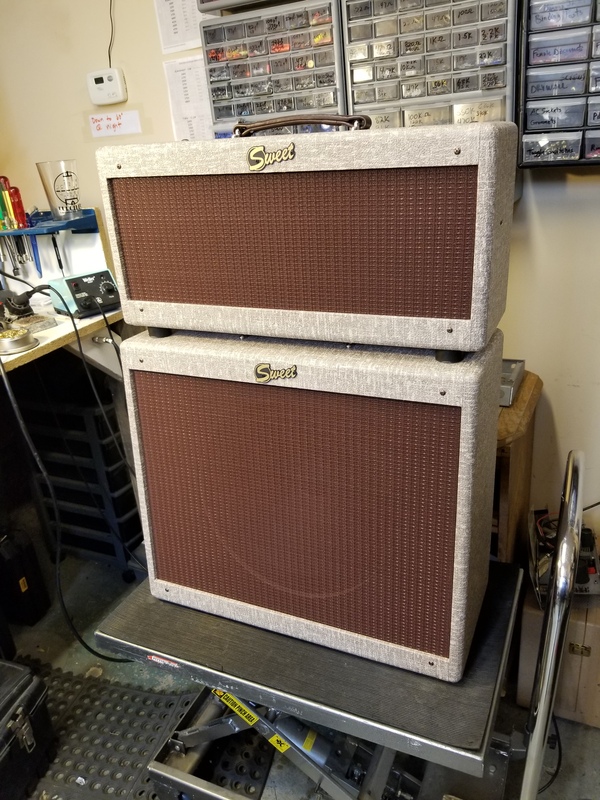 That’s what handbuilt amps are all about, finding YOUR tone! 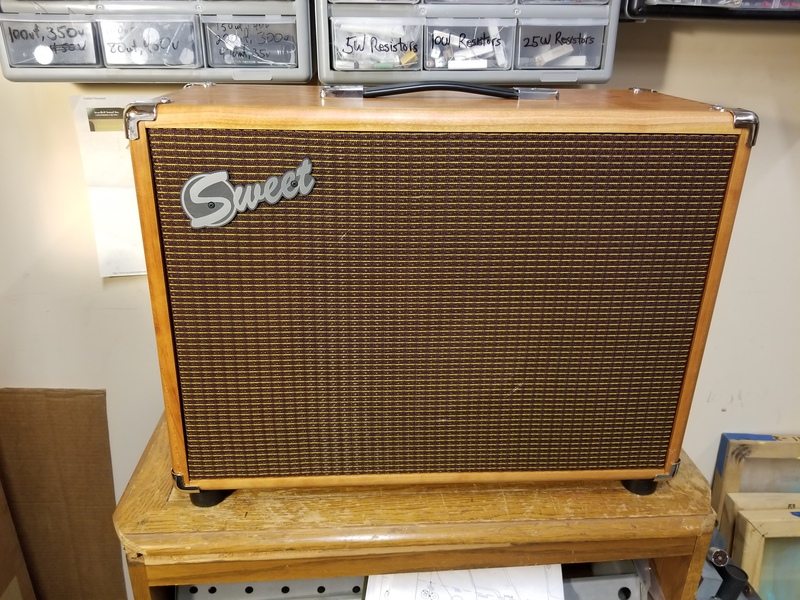 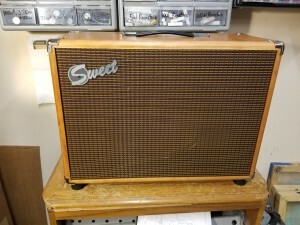 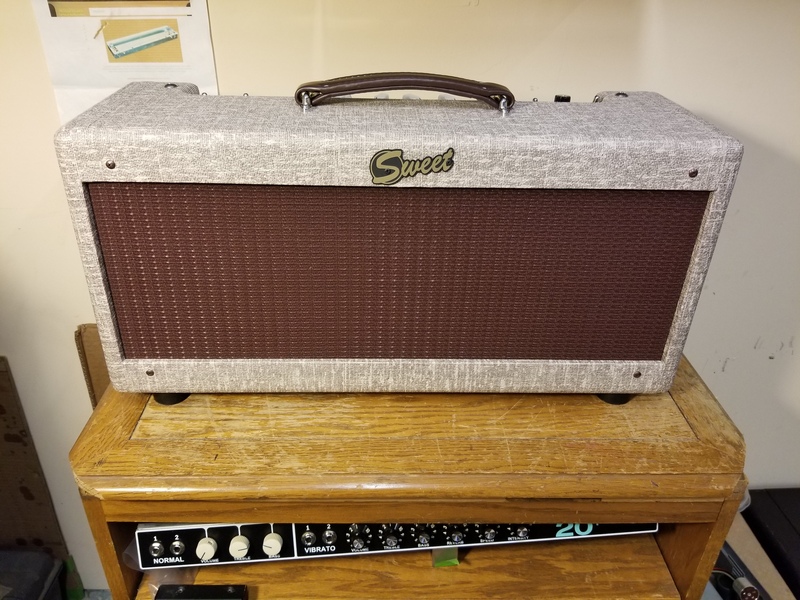 The first Sweet Low Power Tweed Twin build is completed! 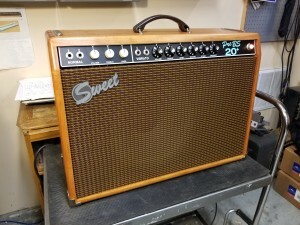 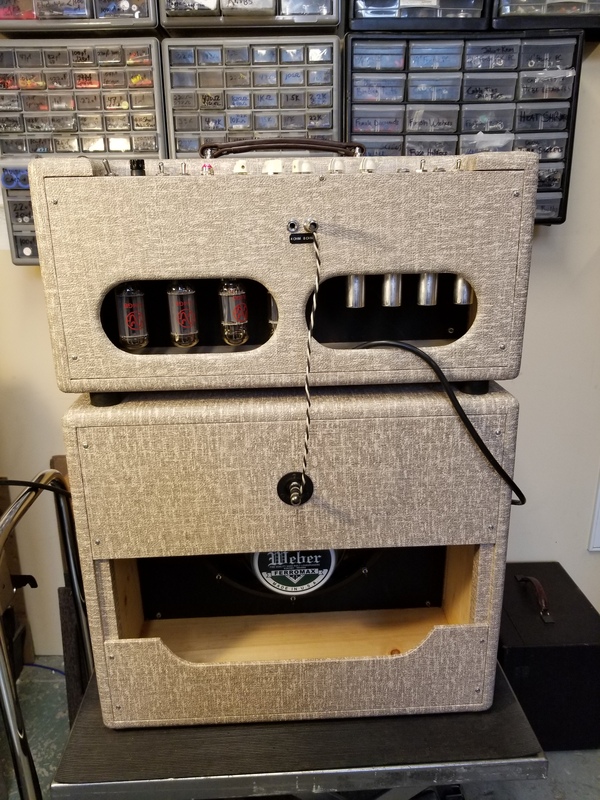 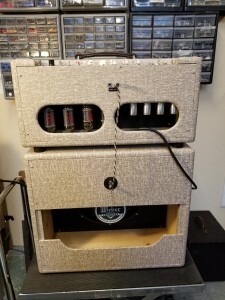 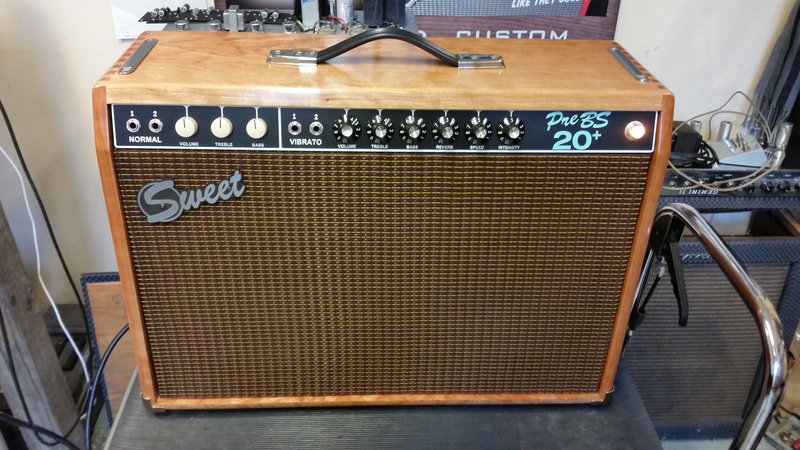 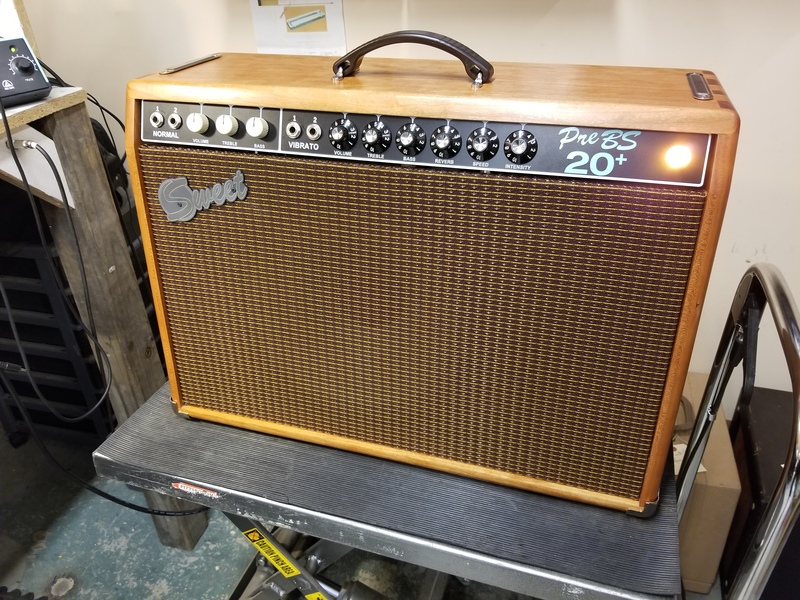 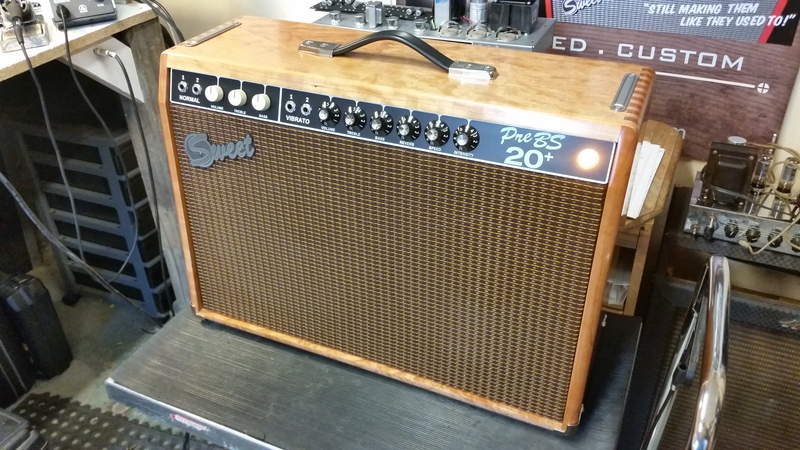 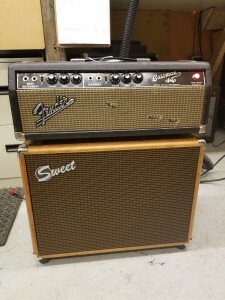 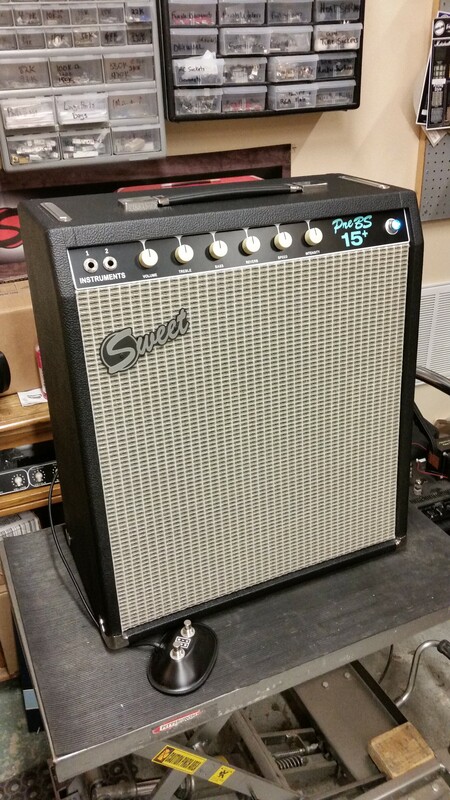 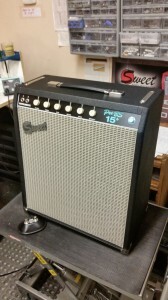 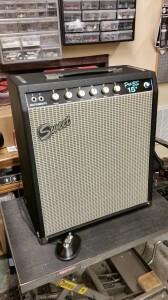 This is one of the most unique and interesting Fender tweed era models with dual rectifier tubes, a unique pre-amp circuit, cathodyne phase inverter(like tweed Bandmaster and Princeton Reverb), and a quite large output transformer for a pair of 6L6 power tubes. 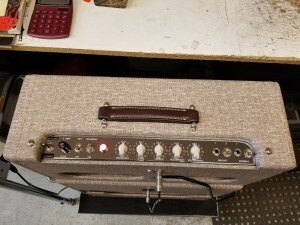 As always, I’ve added a few extra features for versatility like separate pre-amp cathode resistors and caps for less interaction between channels and the ability to use different tubes for each channel. I’ve also added a gain switch for each channel, push-pull brite switch for each channel, bias trim pot, and a negative feedback switch. 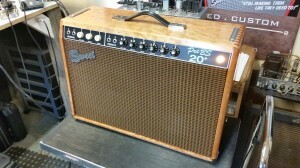 The result is a beautiful touch sensitive tweed tone with lots of character and compression when pushed. 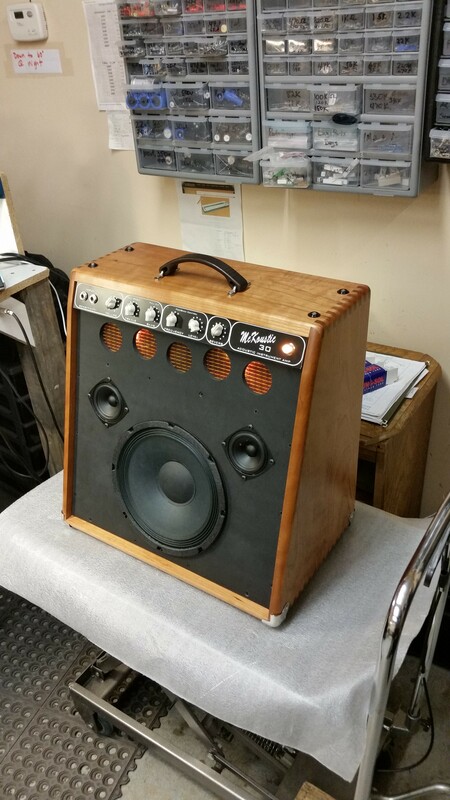 Well suited for any rootsy musical genre! 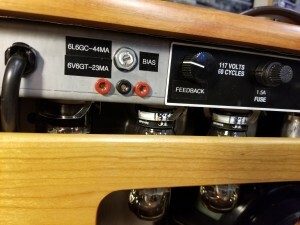 Output is 25W-45W depending on power and rectifier tubes used but sounds best to me with the stock dual 5U4G and 6L6GC combination. 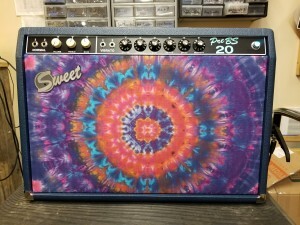 As an amp tech for several decades, I cant tell you how many broken and bent tubes and damaged sockets I’ve seen in Blues and Pro Jrs. 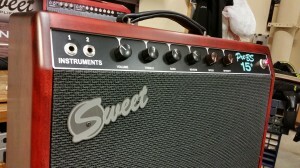 The new III version comes with a cage but it is not available as an accessory. 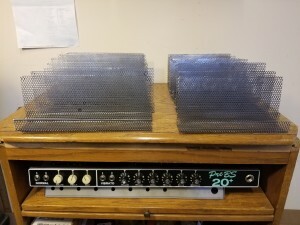 So, at the request of a regular customer, I made a couple of protective tube cages and then decided to make them available to everyone. 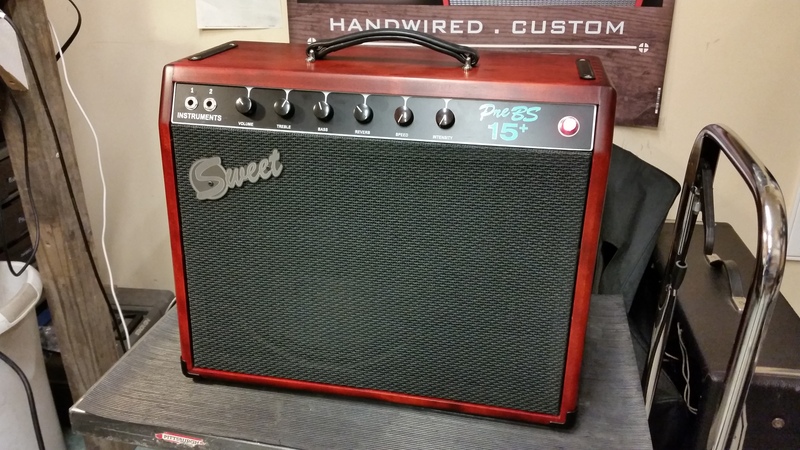 Introducing a new Sweet combo for acoustic instruments, the McKoustic 30! 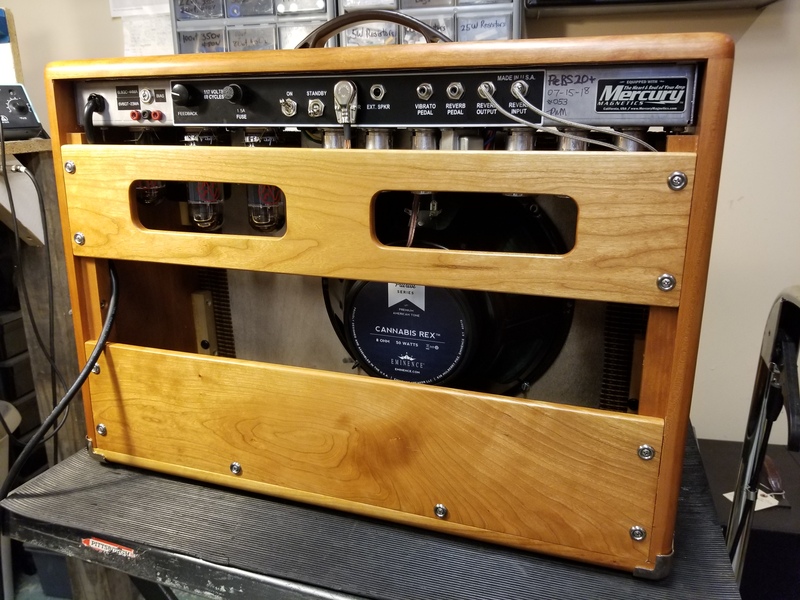 Another McKeever collaboration with my dad who built the cab from solid cherrywood and finished with hand rubbed oil/urethane. 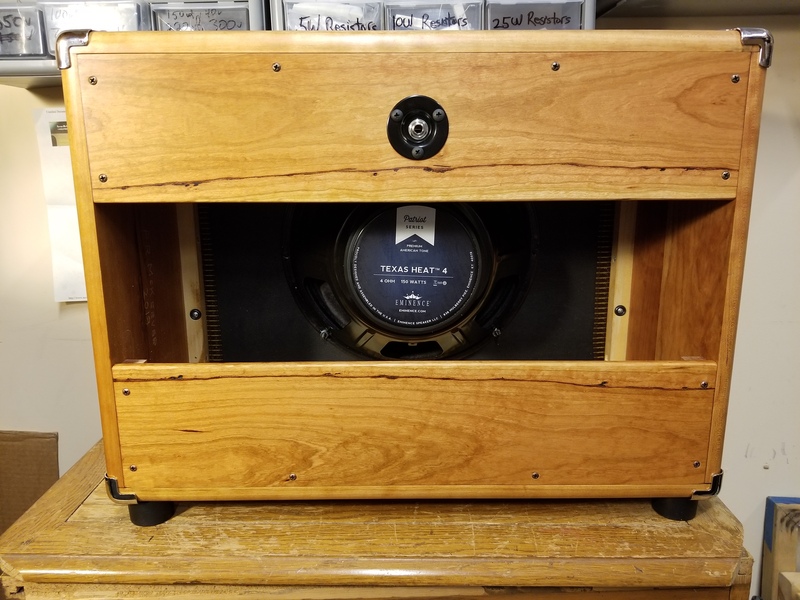 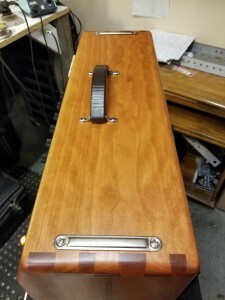 The sealed and ported cab features full range Eminence 10″ and 3″ drivers for a natural reproduction of your acoustic guitar, mandolin, guitaron, uke, or violin. The pre-amp has been tuned specifically for acoustic instruments and features a feedback control section with selectable frequency and level control as well as a push-pull bass cut and push-pull bright control. Tested with a passive K&K equipped boutique guitar as well as a modern Seagull with active Fischman pickup and pre-amp system. This amp will sound like your guitar but louder! 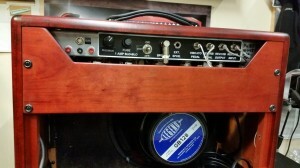 Bring your acoustic guitar/instrument for a demo to Chicago Fret Works before the client pickups it up! 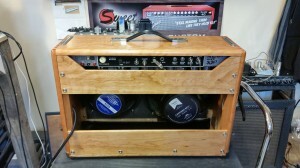 * This is also the prototype for a similar all tube bass combo coming soon! 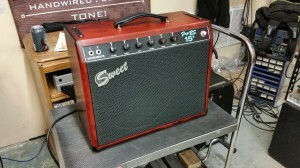 Another gorgeous cherrywood cab with hand rubbed oil finish built by my dad in Pennsylvania! 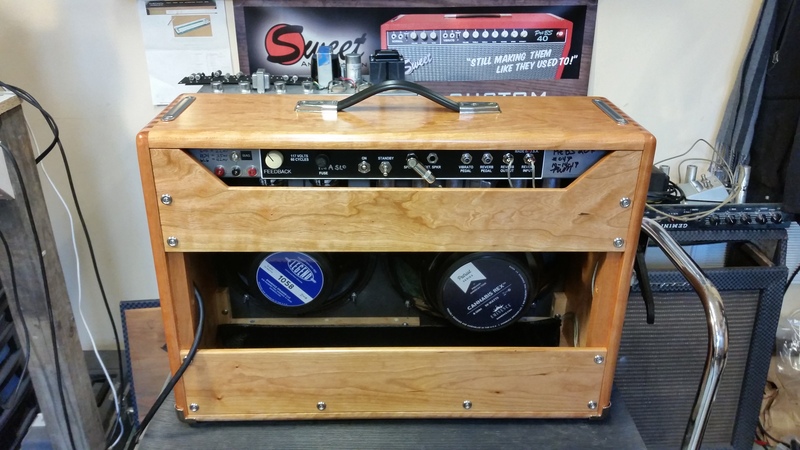 This one has all of the usual features plus user adjustable bias on the rear panel. 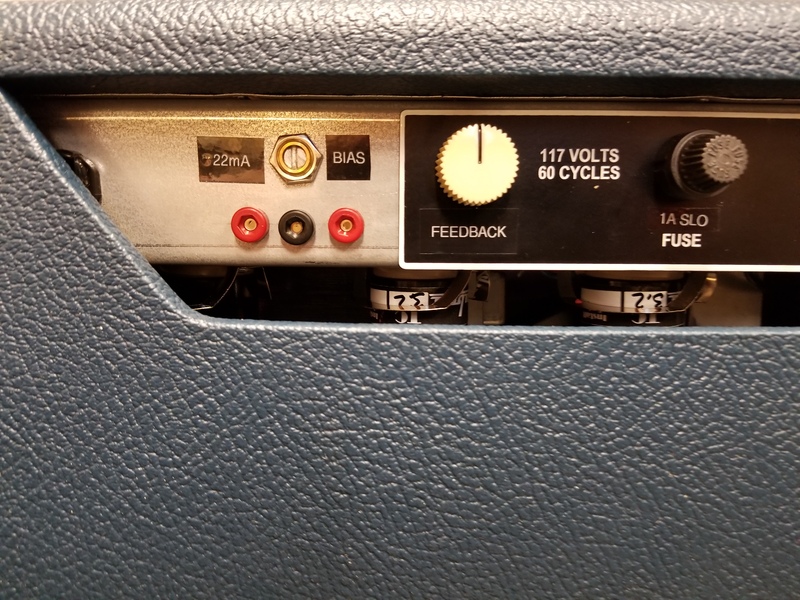 Just set your meter to the mV scale, attatch the probes to the test points, and turn the pot to the recommended setting. 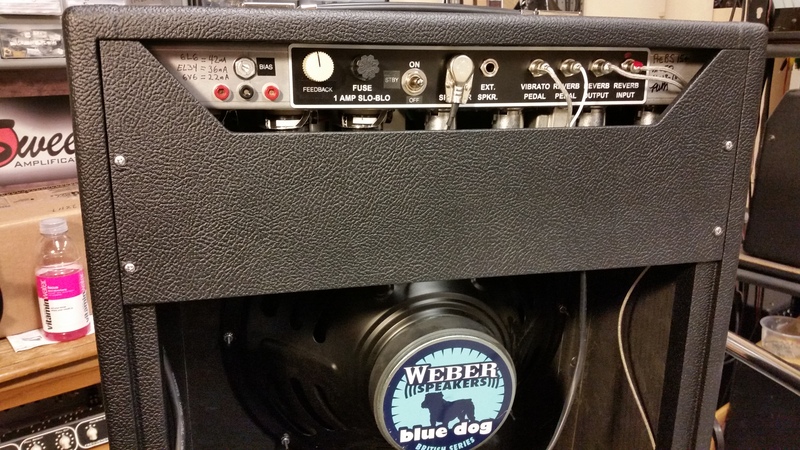 You can use 6V6 or 6L6 power tubes and all of their variations as well which include ; KT66 and 5881. 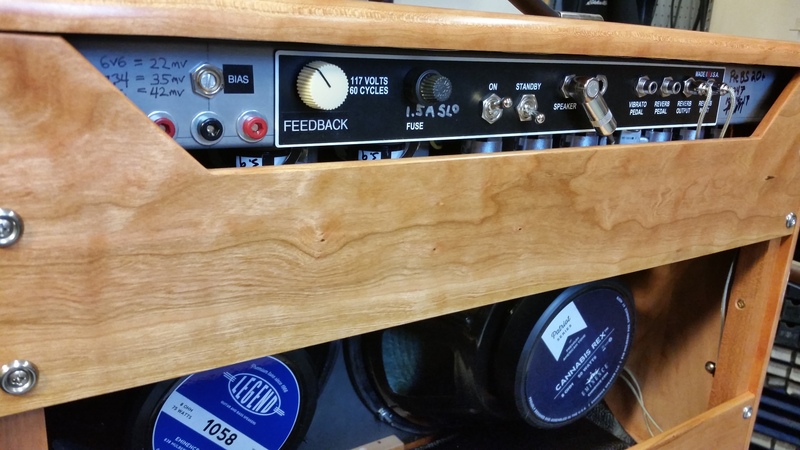 Experiment away and get just the right tone and headroom for your gig or recording project. 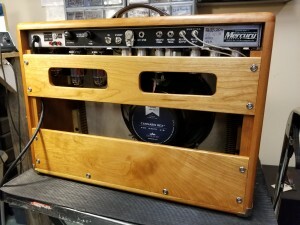 Save $ by doing it yourself! 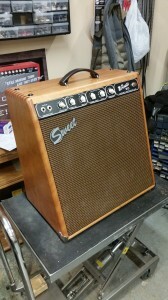 And, the holiday special applies to this one too! No upgrade charge for the hardwood cab, same price as regular PreBS 20+! 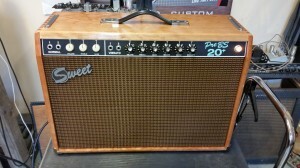 Regularly $2125 Now $1925 SOLD!